This week, decades of debate have been apparently settled, as it has been announced that there is currently liquid water on Mars. A team from the Italian National Institute for Astrophysics has discovered a lake under the planet’s south polar ice cap. It is about 20 kilometres wide, and full of liquid water. But how did the team discover this and what does this mean about the possibility of life on Mars? Georgia Mills spoke to Cambridge University astrophysicist Carolin Crawford to find out how they discovered this lake. Carolin - Well, if you’re going to find water underground you have to use radar. This discovery was made with the MARSIS instrument above the surface of the planet. It’s riding on the European Space Agency’s Mars Express satellite and what it does is it pulses radar signals down to the ground and then receives the signal as it’s being reflected back. And the timing of the signal return and also how much it’s being diminished by that reflection tells you something about what lies under the ground. What they discovered, about one and a half kilometres underneath the south pole, there’s a very bright reflection signal which they interpret as a lake of liquid water right under the south pole. Georgia - That’s really exciting, but how confident can we by in this interpretation? Carolin - Well that’s always the question because you’re not actually there sampling it yourself, you’re relying on radar signals. Your understanding of the temperature profile underneath the south pole, underneath the crust of Mars; also the chemical composition of the rocks and the soil, and you’ve got to be absolutely sure about interpreting those radar signals right. It looks like they’ve done a good job but there will have to be further confirmation, and also just to see if there are any other signals like this. Could it be due to anything else, but currently, it looks like a boundary between the bottom of the ice and the beginning of this lake and that’s their best interpretation. Georgia - We’ve always thought that there wasn’t liquid water on Mars - at least that was the standard opinion. So why didn't we think it was there and why is it only in this place? Carolin - Well you can’t have liquid water on the surface of Mars. That’s the key thing because the air pressure’s incredibly low and the temperatures very low, so it’s either frozen or if it’s exposed to the air it just sublimates so it evaporates away completely. So the only possible place you could have liquid water is if its been somewhere like the south pole where it’s squeezed by the pressure, the weight of all those layers of ice and dust on top, and so you’ve got that pressure which provides the heating. The other thing that’s important to say that we’re talking about water but this is going to be not water like comes out of your tap. This is going to be very briney, very salty water and some of those salts can almost act like an antifreeze. So both the increased pressure and that salty content means that it can stay liquid even though it may be sort of -10, -20 degrees C.
Georgia - What’s the next step for this team? What are they going to do next? Carolin - They’re obviously going to check the signal, the interpretation of the signal. They’ll work with other radar teams just to check nobody’s got any other idea. You’re going to have to see whether this is typical - are there a large number of lakes. But really, if you want to investigate it, you need to go there and we’re a long way off doing that because you’re going to have to land a completely sterile lander at the south pole and work out a way of drilling down one and half kilometres and extract some core sample. That’s going to be your best bet to actually see the water and know it’s there. Georgia - Here’s the question on everyone’s minds: what does this mean about the possibility of life on Mars? Carolin - Well it’s exciting. Not only are we interested in the water history of Mars, but we know on Earth wherever we find water we find life. So the idea that there’s a persistent pocket of liquid water it just raises the possibility that there is an environment already on Mars which could host life, and here we’re talking microbial life. But also that it’s more likely in the past because we know Mars’ south polar cap was at least twice as big in the past, there was lots more ice to melt to form the water. And also there would have been more radioactive heating in the crust which would have also provided the heat needed to turn this to water. So it may not be relevant necessarily for life now but it does certainly provide a big first step to saying here’s an environment where you could have had life in the past. Previous Can your cat's parasites help you succeed? 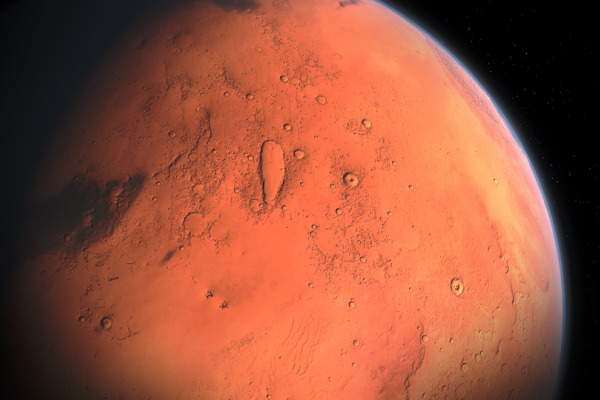 Could extremophile bacteria survive on Mars?